I originally wrote this post a couple of Autmuns ago, but it's just one of those posts that I think deserves a yearly redux. Last year I added about six geraniums to my overwinting project, and all six did great and will be overwintered once again this year. 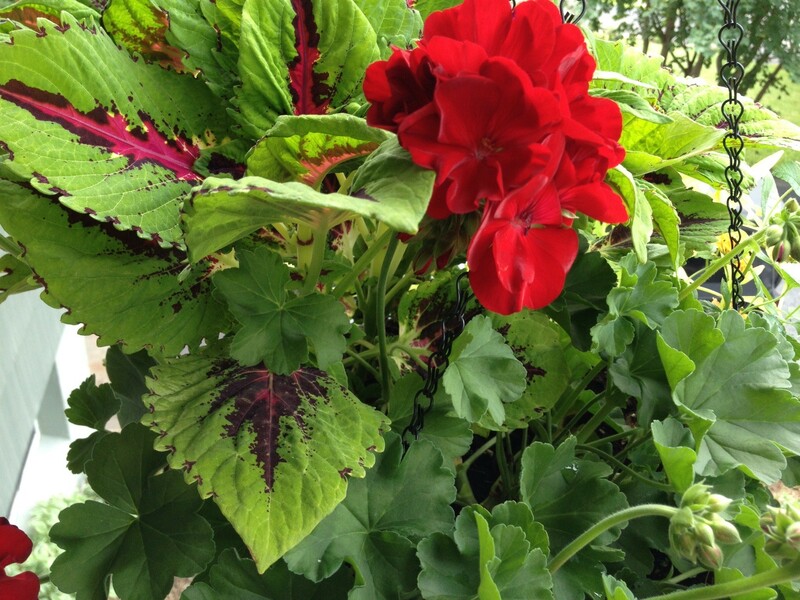 Not only does overwintering save your geraniums from the compost heap, but it saves you money as well! 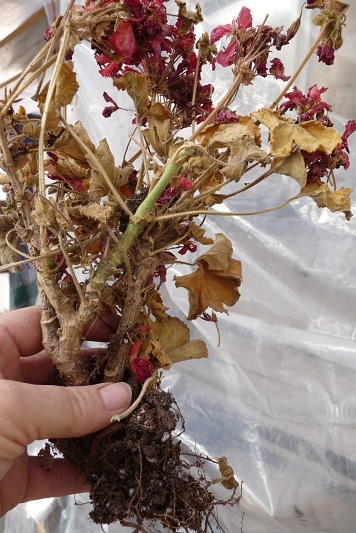 So if you have geraniums that you just can't bear to compost, take a look at the options I've outlined below for overwintering, and I guarantee you won't be disappointed. Dig your geraniums just before a frost shake all the soil from the roots, and hang them in a dry location where the temperature will remain in the 40s or low 50s. Once every month you should soak the roots for about an hour or so to prevent them from completely drying and dying. All the leaves will die but the stem will remain thick, and healthy. In the spring plant the geraniums in pots and remove any dead stems. I also suggest feeding the plant right away with Authentic Haven Natural Brew for a nice boost, which can be found at http://www.manuretea.com. If your geranium is located in a flowerpot like mine is, bring it inside and don't water it. Store it in the same environment you would an uprooted plant. Check on the plants occasionally, and add a little water to the soil once in a while to keep them barely alive. Next spring, remove the dead areas and begin watering, again I suggest Authentic Haven Natural Brew for a nice boost, which can be found at http://www.manuretea.com. Place them in a sunny window, and voilà! This is the geranium I used "option #2" on last year. I'll be using "option #1" this year since I have so many, and so little space. First, cut the top 4-6 inches off each branch. Remove and discard any flower stalks, even if they have buds on them. Next, take off all the leaves on the bottom 2-3 inches of the stem, and dip the cutting into rooting hormone powder or liquid. Finally, Place the stem in sand or perlite, add water, and place it/them in a sunny window. Once the roots start to develop, you can either pot them inside or wait until spring to plant them outside. Many of your other favorite outdoor potted plants can be saved through the winter in the same ways. However, the proper research should be conducted for the best results. As I said I think the methods above are going to be most successful for my geraniums, and if you have your own favorite geraniums I would recommend trying at least one. This entry was posted in DIY, Gardening Tips, Homeowner, Indoor Gardening, Landscaping, Uncategorized and tagged Compost, Frost, Garden hose, geraniums, Master gardener program, overwintering, Pelargonium, Plant, Sowing, the perfect garden hose, Twitter. Bookmark the permalink.